Fantastic for conventional tape and vinyl stop sounds, plus less recognisable pitch and filter wobbling effects. Excellent stop effect. Effective sequencing. Free or note value speed settings. Good presets. Versatile. Sequencer only controls Stop. No musical interval indicators for Pitch. Some classic sound effects are just too awesome to be allowed to die out, and near the top of the list is the vinyl/tape stop effect, beloved of DJs for decades. The current crop of glitch-heavy EDM has put it back in the spotlight, and there are a fair few free plugins available that attempt to recreate it. 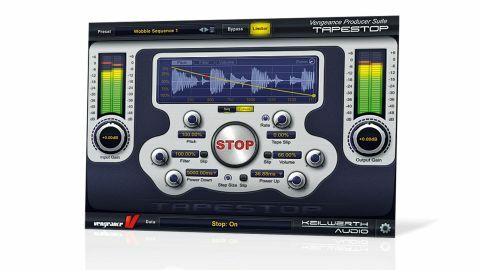 Vengeance Sound, however, wasn't satisfied with them - and thus was Tapestop born. At a basic level, Tapestop (VST/AU/AAX) does exactly what you'd expect. Engage the Stop button and the audio slows down; release it and it speeds up again - but there's more to it than just that. The first two key controls are Power Up and Power Down, setting the duration of the slow-down and subsequent speed-up when Stop is engaged and disengaged. Both range from 5ms to 5 seconds and offer a selection of note length options (2/1 to 1/256, including dotteds/triplets). As on a tape deck or turntable, the so-called Pitch dial is actually a speed control, changing the pitch as the audio slows down and speeds up. "The Tapeslip section simulates the subtle wobbling generated by a tape or record not playing back at a consistent, regular rate"
Essentially, it determines the amount by which the signal is slowed down when Stop is engaged: at 100% the signal slows to a complete stop by the end of the Power Down cycle, while a setting of 5% equates to a pitch drop of approximately one semitone (we wish we could see the Pitch change in musical note intervals). The Filter and Volume controls do the same thing, but for filter cutoff sweeps and volume level drops rather than pitch/speed. The Tapeslip section simulates the subtle wobbling generated by a tape or record not playing back at a consistent, regular rate. This is done by modulating the Pitch using an LFO (the main knob sets the Depth, while the little Rate knob handles the speed). Said LFO can also be applied to the Volume and Filter (cutoff) parameters by activating the Slip buttons next to each, as well as the Step Size, which dials in increasingly obvious stepping of the pitching down/up effect, and is particularly effective with longer Power Up/Down settings. There are two graphical programming modes, too. The first is Sequencer (see Stoppage timing), which is the key to unlocking Tapestop's creative usefulness. The second is Curves, allowing graphical editing of the Pitch, Volume and Filter amounts, and designing of non-linear Power Down curves. Finally, in common with other Vengeance plugins, there are input and output meters and gain controls, a basic output limiter and a range of clever and highly illustrative presets. On the surface, Tapestop might appear to be a decidedly niche plugin, but its versatile combination of sequencer, Pitch control, LFO and envelopes offer plenty of more subtle modulation possibilities than just the core 'stop' effect, so its usefulness goes beyond EDM glitches. If anything lets it down, it's the lack of one or two features to enhance these extra creative uses - specifically, a MIDI learn system and a sequenceable wet/dry control (or at least a switch to alternate between the internal and input signals). Despite that, though, as an interesting and flexible tool of real creative worth in a very wide range of electronic music styles, it wholly justifies the asking price.